Why actors get euphoric on winning an Oscar? Blizzard and Phoneix, our canine correspondents for arts & entertainment wonder why Academy awards are that big a deal?~Photograph courtesy Anuradha Kurup. 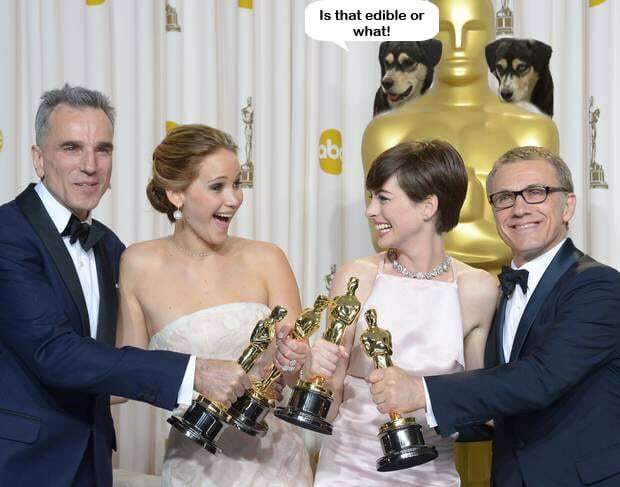 The academy has for long robbed our dear dogs of silverware. From Rin-Tin-Tin who won the most best-actor votes at inaugural Academy Awards in 1929 to Uggie (The Artist) as recent as in 2012, the dogs have been snubbed. When will the headlines read – The dog wins Oscar? Also from the canine detectives, why the dog watched CNBC? Because not everyone wins an Oscar!